Web Summit is a technology conference held annually since 2009. The topic of the conference is focused on internet technology and attendees range from Fortune 500 companies to smaller tech companies. Web Summit 2017 took place in the Altice Arena in Lisbon from November 6 – 9 with 60,000 attendees from over 160 countries. In this article I will write down my experiences and opinions on this event. The reason I have visited this conference is that I have won two OpenSource tickets. 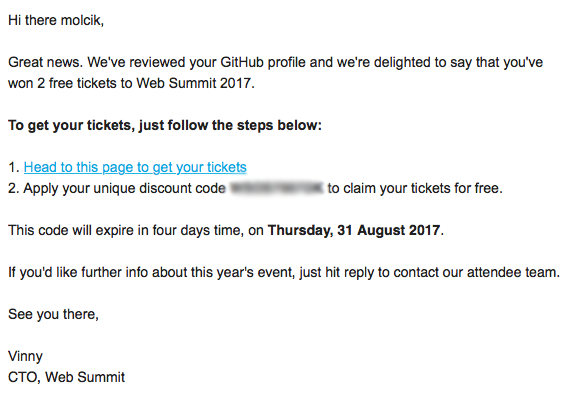 This year there were around 1000 OpenSource tickets for developers like me. Normally one ticket costs around €800, so it’s really expensive. I think most of the people here were from some company representatives, not on their own as me. Another way to get free tickets are Volunteer Tickets. I have met Áquila from Brazil, which was volunteering there and she said it was really cool experience. We have attended many talks and some were better some were blabla. Really cool talk we saw was “VR and AR: Changing the way we work, play and learn” by Amit Singh Amit Singh from Google. This talks was really inspiring. In general talks were not educating but more inspiring. Lots of talks were really boring. For example The Future of Work: Enabling Human Connection by Stewart Butterfield was just talk about slack. Half a hour about chat app is quite boring. Another great talk was Uber’s flying cars by Jeff Holden about how long will it be before your Uber arrives by air. There were 3 kinds of expositions. Alfa, Beta and Partner. Alfas were for startups in early stage, betas were for startups with some traction and partners were for good known companies. Lot’s of expositions were utilising AR or VR, so you could try the cutting edge technology on your own. In Alfas and Betas you could find some really cool startups and discuss them with founders. Conference had 3 food courts with various of food trucks. From vegan to burgers. You can buy beer here too. We had really terrible experience with kebab. The kebab was super small and the chicken meat inside was partially raw. So it was basically Salmonela for €6 in wrap. After this experience we decided to buy food and drink before we went to conference in supermarkets. It’s much cheaper and constant quality. Buy food and drink in advance, food courts are quite expensive. Buy WebSummit Public Transport tickets. You will save some money and have access to any public transport. The organisation of the event was just amazing. Everywhere across city were arrows navigating you to the Web Summit areal. Capacity of halls was enough. And people were really warm, openminded and ready to networking. Problematic was the WebSummit app. I have used iOS version and app was badly organised and very slow. When I say slow I mean really slow, for example registration in app took about 10 minutes.